Some people find it easy to transition from one thing to the next without much struggle. They are good at finding the smoothest way to move into the next phase of their lives or current circumstances, or even just easy conversational transitions. While others find it difficult to really move from one place to the next smoothly, often because they don’t care for change. 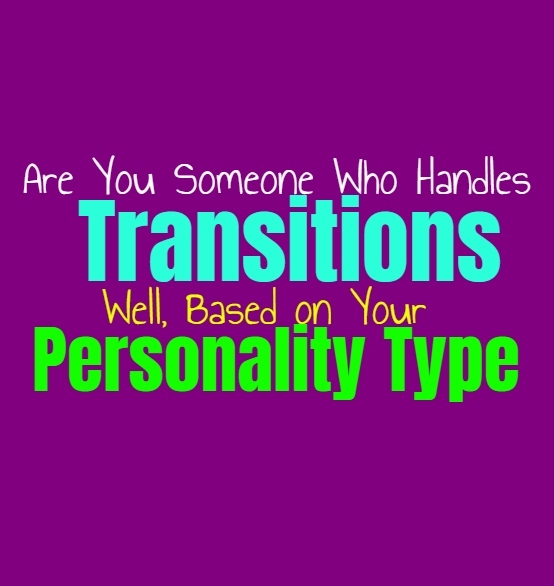 Here is how good you are at transitions, based on your personality type. INFJs are often good at finding ways to make a situation smoothly, especially if they need to transition from one thing to the next. INFJs try to make things more comfortable for others but there are times when change can be unnerving for them. Having to transition from one situation to the next can be draining for them if the change is major. INFJs become unnerved by too much change and so making the transitions can be a bit difficult sometimes. They do their best to make it as comfortable as possible, but there are times when they fight against it entirely. ENFJs try their best to make everything comfortable and smooth in their lives, but sometimes transitions can be challenging. They don’t really enjoy major changes and so having to find a way to make this process easier is something they know is important. They try to find ways to make the transition a bit more comfortable, even though they really aren’t fans of change. For the ENFJ the transitions are vital in order to help make the process of moving on a bit easier for them. INFPs don’t mind having to make transitions into new things, but sometimes they jump right past and into the next experience. For them it isn’t necessary to make every change smooth, since they enjoy new things and being able to shake things up a bit. INFPs dislike boredom and so they would rather experience change than feel trapped in the same situation. For them transitions are easy to make most of the time, especially if they are heading into a new direction which seems promising. ENFPs often do transitions fairly well, without much complaining or griping about it. They enjoy a bit of change and having things shaken up can be more rewarding than feeling trapped in the same position. They enjoy change in their lives and don’t mind having to transition into something new. They might not care about making the transition a long one, since they would rather be able to jump into these new experiences without feeling retstrained. While INTJs aren’t necessarily fans of drastic change, they realize that it is part of life. They are often good at finding ways to transition into the next place without too much struggle. This is something INTJs are naturally good at, especially since they want to be able to be as efficient in a situation as possible. Being able to make the transition smooth and effective is certainly an important factor for the INTJ. They are often good at making this transition to the next place, and will do their best to make it smooth. ENTJs do their best to make any transitions as smooth and as efficient as possible. They realize that there are certain times when change is inevitable and so they want to be sure to make it smooth as they can. ENTJs want to be able to move forward with their lives and don’t like becoming without progress. While they might not enjoy constant change ENTJs would rather have a way to transition and make the entire experience more comfortable and to maintain a sense of control. INTPs don’t find change all that unnerving, and don’t mind jumping into the next things. They don’t mind having to adjust and make the transition smoother, but they also don’t mind simply skipping onto the next thing. INTPs enjoy being able to experience new things so that they can learn from them and not feel trapped or stagnant. Transitions might be important but sometimes INTPs skip over this phase and straight onto the next one. ENTPs don’t always find a need for transition periods, especially when people tend to drag them out for too long. They enjoy jumping into the next thing without having to spend too much time preparing for this. ENTPs want to experience new things and enjoy challenging themselves whenever they can. For them change is not the worst thing, they often prefer it over feeling stagnant or trapped in the same boring position their entire lives. ISTJs really don’t like change but they definitely don’t like when things change without some sort of preparation. They try their best to make the transitions smooth and find ways to improve and be more efficient. For the ISTJ having a transition period to adjust to change helps them a lot, and helps them do the properly research to move forward. ESTJs try to make transitions as smooth as they can, but they really don’t enjoy having to endure much change. For them having time to transition and do the right amount of preparation in order to handle the change, is certainly the most comforting option. They really don’t like having to jump into something new without having this time to be ready for it and become more efficient in what is to come. ISFJs don’t really like having to endure change, but they prefer to have time to transition into the next phase. Having this change to make the transition smoother and more comfortable is certainly something that the ISFJ will do their best to take advantage of. Having smooth transitions is definitely important to the ISFJ and it helps make the change much easier to handle and operate with. ESFJs do their best to make transitions as smooth and as comfortable as possible, especially when they are stepping into a big change. They don’t like being tossed into something new without having the time to prepare for what is to come. They believe in taking advantage of whatever transition time they have and hope to try and make it as smooth and harmonious as they possibly can. ISTPs don’t mind change and for them transitioning into the next step is rather easy. They don’t need to make this process slow in order to feel comfortable, instead they enjoy jumping into the next step without too much preparation. ISTPs enjoy new experiences and don’t want to feel trapped in the same boring place for too long. For them change is more rewarding than feeling stuck or stagnant. ESTPs really don’t mind stepping into change and actually enjoy being able to experience something new. For them it is often more rewarding to jump into these changes without having to take too much time to prepare for it. ESTPs are good at making these transitions, but sometimes they skip right past this phase and into the change ahead of them. ISFPs can often handle transitions rather comfortable and easily, since they do enjoy experiencing new things. For them feeling stuck or stagnant is a bit exhausting and draining for them. They want to be able to really experience life and enjoy living in the present without feeling like someone is restraining or controlling them. ESFPs don’t always need transitions in order to step into something new, instead they just like diving in. They want to experience new things and feel most rewarded when things are shaken up a bit. ESFPs don’t like feeling stagnant or stuck in the same boring position and simply want to feel free to experience life on their own terms. They are free spirits who want to be able to really dive into something new with a sense of freedom and excitement.